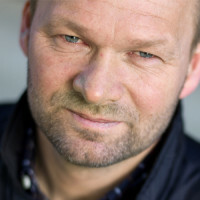 Thursday, April 25th, 2019 is a new big day for bioCEED, as Torstein N. Hole will defend his PhD degree at the University of Bergen with the dissertation: “Learning through practice in biology education». We congratulate Torstein with an excellent thesis, and wish him good luck with the defense. 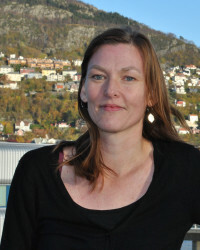 Associate professor, Anne Elisabeth Bjune, Department of Biological Sciences, UiB (chair of the committee). The defense will take place at Auditorium 2, Realfagbygget and start at 10:30. Praksis har lange tradisjoner i profesjonsfag, men har sjelden vært en del i av undervisningen i disiplinfag som biologi. I sin ph.d. har Hole undersøkt hvordan studenter lærer i tre ulike former for praksis i biologi, feltkurs som er en type praksis som har flere likhetstrekk med praksis hos profesjonsfag, arbeidspraksis som har blitt undersøkt via studenters blogginnlegg, og arbeidspraksis hos fiskehelsebiologer, musikkprofesjonsstudenter og lærerstudenter. I analysen av studentenes læring har det kommet frem hvordan opplevelser i praksis henger sammen med utviklingen av studenters personlige epistemologi. Gjennom en sosiokulturell analyse av disse har Hole studert hvordan studentene utviklet sin forståelse av fagene de studerer, deres tilnærming til læring og sin egen rolle som fremtidig biolog. I de ulike studiene påpekes det også ulike pedagogiske muligheter i feltkursundervisning, gjennom samhandling mellom naturvitenskapelige fenomener og student, vurdering av studenter gjennom blogginnlegg og sammenhengen mellom opplevelser i praksis og undervisning på universitetet i ulike utdanninger. Torstein N. Hole held his trial lecture on March 8th on the topic: “Active learning and active students – when, how, and why?”. This lecture was videorecorded and is available here. 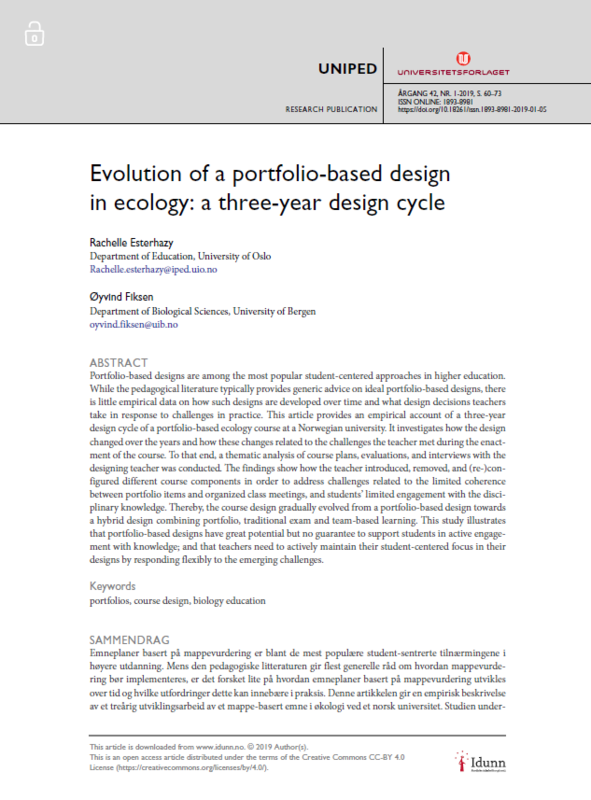 Rachelle Esterhazy (Department of Education, University of Oslo) and Øyvind Fiksen (Department of Biological Sciences, University of Bergen) have recently published the paper “Evolution of a portfolio-based design in ecology: a three-year design cycle” in Uniped. Portfolio-based designs are among the most popular student-centered approaches in higher education. While the pedagogical literature typically provides generic advice on ideal portfolio-based designs, there is little empirical data on how such designs are developed over time and what design decisions teachers take in response to challenges in practice. This article provides an empirical account of a three-year design cycle of a portfolio-based ecology course at a Norwegian university. It investigates how the design changed over the years and how these changes related to the challenges the teacher met during the enactment of the course. To that end, a thematic analysis of course plans, evaluations, and interviews with the designing teacher was conducted. The findings show how the teacher introduced, removed, and (re-)configured different course components in order to address challenges related to the limited coherence between portfolio items and organized class meetings, and students’ limited engagement with the disciplinary knowledge. Thereby, the course design gradually evolved from a portfolio-based design towards a hybrid design combining portfolio, traditional exam and team-based learning. This study illustrates that portfolio-based designs have great potential but no guarantee to support students in active engagement with knowledge; and that teachers need to actively maintain their student-centered focus in their designs by responding flexibly to the emerging challenges. Until 12/2015, I was Head of Education at BIO and leader of WP1 ‘A collegial learning culture among teachers’ – promoting a shift from teaching to student learning perspective. Torstein Nielsen Hole, Gaute Velle, Hanne Riese, Arild Raaheim and Anne Laure Simonelli have written an article about learning in work placements among biology students. To investigate learning they have focused on personal epistemologies. That is, students’ accounts of learning and knowing. Students have written about their learning experiences in blogs; using student blogs as a data source for epistemologies is quite novel. Further, this emphasizes the value of blogs as a tool to foster student reflection through assessment. On the basis of their analysis, they conceptualize how students’ personal epistemologies develop in work placements through interactions with various contexts, dispositions and conceptual and procedural knowing. For further details on the work placement course itself, see this paper by Velle et al. 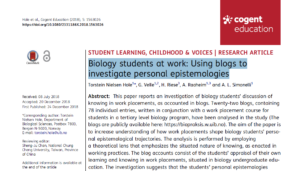 This paper reports an investigation of biology students’ discussion of knowing in work placements, as accounted in blogs. Twenty-two blogs, containing 78 individual entries, written in conjunction with a work placement course for students in a tertiary level biology program, have been analysed in the study (The blogs are publicly available here: https://biopraksis.w.uib.no). The aim of the paper is to increase understanding of how work placements shape biology students’ personal epistemological trajectories. The analysis is performed by employing a theoretical lens that emphasizes the situated nature of knowing, as enacted in working practices. The blog accounts consist of the students’ appraisal of their own learning and knowing in work placements, situated in biology undergraduate education. The investigation suggests that the students’ personal epistemologies develop in an interplay with context and personal epistemologies to shape their trajectories toward biology knowing. These trajectories have been analysed in terms of their procedural, conceptual, and dispositional dimensions. The use of blogs as a data source is argued to be appropriate to analyse personal epistemologies. Other strengths and weaknesses of this design are discussed. Jorun Nyléhn, Associate Professor at bioCEED and BIO, and colleagues have recently published the article “The “Species” Concept as a Gateway to Nature of Science.” in Science & Education. Understanding how science works has become a primary goal in education, as it connects to critical thinking and the foundations of knowledge. This includes the more complex and overarching topics like evolutionary biology. In this recently published paper from the Department of Biosciences, UiB and the Department of Teacher Education and School Research, UiO, the potential of using species concepts as a means to increase the knowledge of the science of biology is investigated. The article focus on the most common species concepts in science, includes aspects from the philosophy and nature of science, and four recommendations for teaching biology are given. The nature of science (NOS) is a primary goal in school science. Most teachers are not well-prepared for teaching NOS, but a sophisticated and in-depth understanding of NOS is necessary for effective teaching. Some authors emphasize the need for teaching NOS in context. Species, a central concept in biology, is proposed in this article as a concrete example of a means for achieving increased understanding of NOS. Although species are commonly presented in textbooks as fixed entities with a single definition, the concept of species is a highly discussed one in the science and the philosophy of biology. A multitude of species concepts exist, reflecting both the views and interests of researchers and their utility in different organism groups. The present study serves to address the following questions: How do textbooks in Norwegian primary and lower secondary schools present the concept of species? Can inquiries into the concept of “species” serve to highlight aspects of NOS? A review of the available literature on species and species concepts in school is also performed. In the schoolbooks, the biological species concept is commonly used as the main definition, whereas the morphological species concept is represented by additional remarks of similarity. The potential and pitfalls of using the species concept for teaching NOS are discussed, with NOS being discussed both as a family resemblance concept and as a consensus list. Teacher education is proposed as a starting point for inducing a more sophisticated view of biology into schools. Jorun Nyléhn har en doktorgrad i botanisk økologi fra Universitetet i Oslo. Hun har vært ansvarlig for naturfagdelen av TIMSS (Trends in International Mathematics and Science Study) i Norge, en undersøkelse av elevers kunnskaper i realfag på 4. og 8. trinn i nærmere 70 land. Videre har hun omtrent fem års erfaring fra grunnskolelærerutdanningen, med undervisning i hovedsakelig biologi og biologididaktikk. Hun har faglige, fagdidaktiske og populærvitenskapelige publikasjoner; erfaring som redaktør og grafisk designer; og undervisningserfaring fra universitet, høgskole og videregående skole. Nå planlegger hun å forske på læring relatert til evolusjonsbiologi. Perceived novelty in mobile applications is an inevitable aspect of today’s technologies. Studies suggest that this perceived novelty effect increases motivation but wanes once the user becomes accustomed to the product. Using a Self-Determination Theory approach, the present study investigates how different tools relate to students’ motivation, basic psychological needs, and achievement, over and above the effect of perceived novelty. The results from a randomized controlled experiment show that a mobile-learning tool and a digital version of a textbook are perceived as more novel than a traditional textbook. However, only the mobile-learning tool enhances the students’ basic psychological needs. Additionally, using path-analysis, we find that the mobile-learning tool, need-satisfaction within the mobile-learning tool, and autonomous motivation account for achievement and internalization, over and above the effect of novelty. We argue that this finding is due to the inherent need-supportive elements within the mobile-learning tool that satisfy the basic psychological needs. 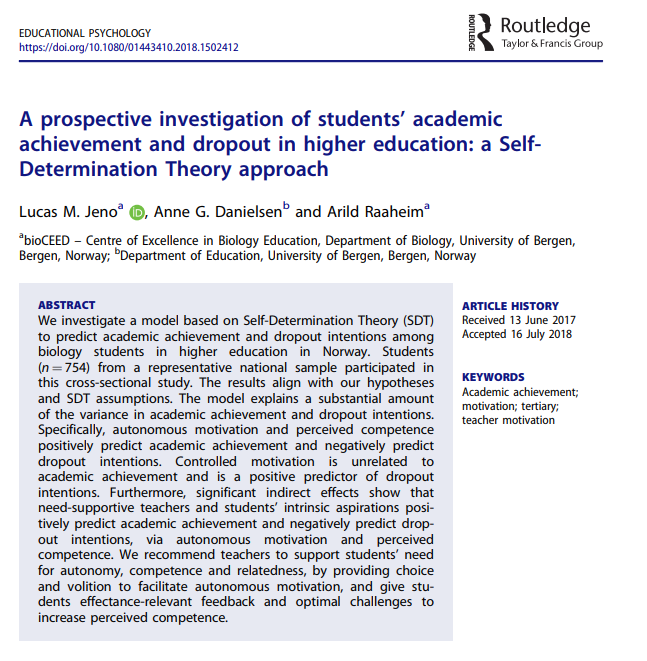 Lucas Jeno and colleagues from bioCEED have recently published the article “A prospective investigation of students’ academic achievement and dropout in higher education: a Self-Determination Theory approach”. We investigate a model based on Self-Determination Theory (SDT) to predict academic achievement and dropout intentions among biology students in higher education in Norway. Students (n = 754) from a representative national sample participated in this cross-sectional study. The results align with our hypotheses and SDT assumptions. The model explains a substantial amount of the variance in academic achievement and dropout intentions. Specifically, autonomous motivation and perceived competence positively predict academic achievement and negatively predict dropout intentions. Controlled motivation is unrelated to academic achievement and is a positive predictor of dropout intentions. Furthermore, significant indirect effects show that need-supportive teachers and students’ intrinsic aspirations positively predict academic achievement and negatively predict dropout intentions, via autonomous motivation and perceived competence. We recommend teachers to support students’ need for autonomy, competence and relatedness, by providing choice and volition to facilitate autonomous motivation, and give students effectance-relevant feedback and optimal challenges to increase perceived competence. Lucas Jeno and colleagues from bioCEED have recently published the article “The effects of m‐learning on motivation, achievement and well‐being: A Self‐Determination Theory approach”. From the lens of Self‐Determination Theory, this study investigated the effects of a mobile application tool for identifying species on biology students’ achievement and well‐being. It was hypothesized that the mobile application, compared to a textbook, would enhance feelings of competence and autonomy and, in turn, intrinsic motivation, positive affect and achievement, because the mobile application’s built‐in functions provide students with choice and volition, informational feedback, and optimal challenges. Fifty‐eight second‐year students were randomly assigned to use either the mobile application or a textbook for a learning task. Well‐being was assessed before and after the learning task, and intrinsic motivation, perceived competence, perceived autonomy and achievement were assessed after the task. Results indicated that the mobile application, relative to the textbook, produced higher levels of students’ perceived competence, perceived autonomy and intrinsic motivation. Further, the mobile application had indirect effects on positive affect through autonomy, competence and intrinsic motivation, and on achievement through competence. Jeno, L. M., Adachi, P. J. C., Grytnes, J.-A., Vandvik, V., Deci, E. L. The effects of m‐learning on motivation, achievement and well‐being: A Self‐Determination Theory approach (2018). British journal of educational technology , 2018. 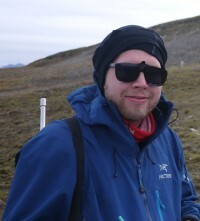 Torstein N. Hole, Ph.D student at bioCEED and PRIME, has recently published the article “Working and Learning in a Field Excursion” in CBE – Life Sciences Educational. This study aimed to discern sociocultural processes through which students learn in field excursions. 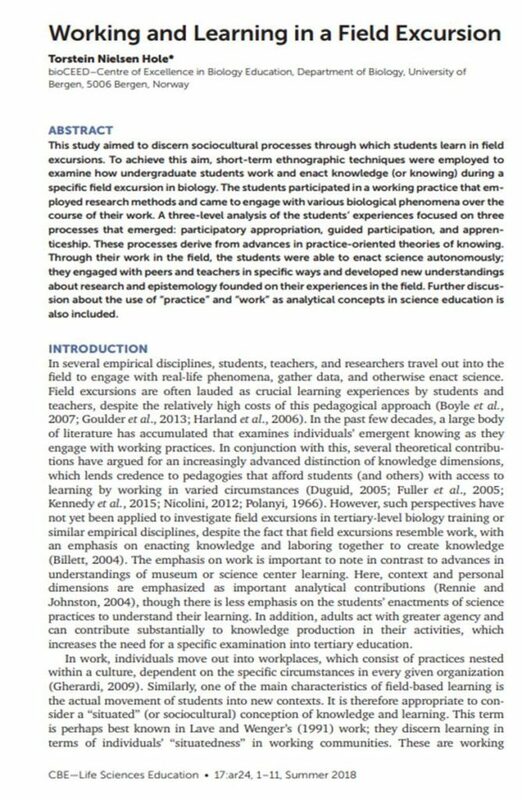 To achieve this aim, short-term ethnographic techniques were employed to examine how undergraduate students work and enact knowledge (or knowing) during a specific field excursion in biology. The students participated in a working practice that employed research methods and came to engage with various biological phenomena over the course of their work. A three-level analysis of the students` experiences focused on three processes that emerged: participatory appropriation, guided participation, and apprenticeship. These processes derive from advances in practice-oriented theories of knowing. Through their work in the field, the students were able to enact science autonomously; they engaged with peers and teachers in specific ways and developed new understandings about research and epistemology founded on their experiences in the field. Further discussion about the use of “practice” and “work” as analytical concepts in science education is also included. February 16th Lucas Jeno successfully defended his doctoral dissertation “The antecedents and consequences of students´ autonomous motivation. The relation between need-support, motivation, and academic achievement” and completed his PhD degree at the University of Bergen! Higher education has traditionally rested on teacher-centred education. Recently, there has been a shift towards learner-centred education. Innovative teaching tools, active teaching methods, and teachers that encourages a deep approach to learning, are examples of how to facilitate learner-centred education. Central to learner-centred education is increasing student motivation for learning. Moreover, recent systematic reviews and meta-analyses suggest that learner-centred education, compared to teacher-centred education, increase student achievement. Guided by the framework of Self-Determination Theory, this thesis investigates different antecedents for student motivation, and how in turn, autonomous motivation relates to achievement. It is hypothesised that the extent that the environment (i.e., teacher, innovative teaching tools, active teaching methods) promotes a sense of choice and volition in the learning activity, a sense of optimal challenge and feedback, and a sense of caring and nurture, will increase student autonomous motivation and achievement. Three independent studies were conducted and written up as three papers. Paper I is a national representative cross-sectional investigation of biology students´ prospective achievements and dropout intentions. Results from a Structural Equation Model show support for the proposed hypotheses. Moreover, multi-group analyses show that there are significant differences for level (i.e., BA vs MA) for four paths, but are invariant across genders. Specifically, we found need-support, relatedness, and intrinsic aspiration to be positive predictors of perceived competence and autonomous motivation. Perceived competence and autonomous motivation are positive predictors of achievement and negative predictors of dropout intentions. Extrinsic aspiration is a negative predictor of achievement and a positive predictor of controlled motivation. Controlled motivation is a positive predictor of dropout intentions. Paper II concerns a randomised experiment testing the effect of a mobile-application tool to identify species. Students in the mobile-application condition, relative to students using a traditional textbook, scored higher on intrinsic motivation, perceived competence, and achievement. A path-analysis shows that the mobile-application positively predicts intrinsic motivation and perceived competence. Intrinsic motivation in turn, positively predicts achievement. An indirect effect of the mobile-application to achievement through intrinsic motivation was found. Paper III is a quasi-experiment testing the effect of Team-Based Learning (TBL) relative to traditional lecture-classes. The study is a one-group pre-test/post-test design. Measurement after four weeks of lectures and then after four weeks of TBL shows that the students increased their intrinsic motivation, identified regulation, external regulation, perceived competence, engagement, autonomy-support, need-satisfaction, and perceived learning. The students decreased in amotivation from pre-test to post-test as a function of TBL. A path-analysis using the change scores shows that increases in intrinsic motivation, identified regulation, and perceived competence positively predict engagement, which in turn, positively predicts perceived learning. In conclusion, the results show that active learning, compared to passive learning, is positively related to achievement. However, the findings also show that it is important to consider the underlying motivational processes that either support or thwart student autonomous motivation. That is, active learning promotes autonomous motivation and increases learning when the students´ basic psychological needs for autonomy, competence, and relatedness are supported. In accordance with Self-Determination Theory, a socio-context could be perceived as informational (need-supportive), controlling (need-thwarting), or amotivational (incompetence), thus teachers and institutions are recommended to consider the need-supportive vs need-thwarting elements within learner-centred approaches. The results from this thesis contribute to the knowledge on what increases student autonomous motivation and how active learning methods impact student motivation. Specifically, the use of a prominent metatheory of motivation allows for an analysis of which factors facilitate motivation and what the consequences might be. The use of diverse student samples, study design, and statistical analyses provide strong support for the external validity of the thesis. Friday, February 16, 2018 is a big day for bioCEED, and especially for Lucas Jeno who will defend his PhD degree at the University of Bergen with the dissertation: “The antecedents and consequences of students’ autonomous motivation. The relation between need-support, motivation, and academic achievement». We congratulate Lucas with an excellent thesis, and wish him good luck with the defense. 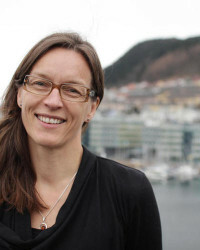 Associate professor, Anne Bjune, Department of Biological Sciences, UiB (chair of the committee). Teachers and learning activities that provide students with choices and opportunities, optimal challenges, and an experience of being taken care of, increase the students’ motivation, learning, and desire to continue their studies. In three studies of students in higher education, Jeno found that students who experience learning activities and teachers who support, rather than hinder, their intrinsic motivation, learnt more and had a stronger sense of well-being. The first study was a national survey of biology students that mapping their experience of motivational support, motivation, life goals, and dropout early in the semester. These data were connected with students’ grades at the end of the semester. The results showed that students who experienced support from teachers and fellow students had intrinsic goals, experienced more mastery and self-determined motivation, which in turn led to better grades and the desire to continue the studies. Students who were more driven by extrinsic goals and extrinsic motivation thought more about dropping out and had lower grades. The second study was an experiment that compared motivation and learning among students who used a mobile application, with students who used a traditional textbook (a reference book) as a means of identifying plants and animals. The students using the mobile application had higher motivation, felt more mastery, and learned more, compared to students using the textbook. The third study compared traditional lectures with more student-active group-based teaching where students collaborate and discuss the material in class, rather than listen to a teacher. The results showed that student-active teaching led to higher motivation, mastery, engagement, and learning for the students. Traditionally, higher education has used teaching methods that passivize students, rather than activating them. This despite the fact that research shows that active learning leads to more motivation, well-being and learning. This thesis contribute new knowledge on how teaching methods and technological tools should be designed to create optimal motivation and learning for students. Higher education institutions are recommended to develop and use methods that support students’ intrinsic motivation in work against dropout, assessment, and learning. 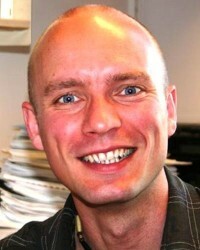 Lucas’ main supervisor is Professor Arild Raaheim, and the co-supervisors are Professor Vigdis Vandvik and Professor Anne Grete Danielsen. Gaute Velle and colleagues from bioCEED and PRIME have recently published the article “Developing work placements in a discipline-oriented education” in the Nordic Journal of STEM Education. Higher education is often divided into discipline-oriented and professional programs. Professional programs prepare students for a specific profession and include relevant theoretical and practical knowledge. Discipline-oriented programs emphasize theoretical knowledge and research within a specific discipline or field. Except for a career within research and higher education, discipline-oriented programs provide less obvious links to future careers. The transition from student life to working life may therefore be challenging. about opportunities for future career and to foster motivation and learning. We have revised the course according to feedback from students, workplace hosts and our experience as course teachers during the six semesters the course has been running. The work placement course is at the bachelor (BSc) level and consists of two main components; a work placement and the student’s own reporting of placement outcomes. For the placement, the students work 140 hours at a workplace as a biologist. The reporting consists of four open blog-posts, one written reflective essay and a final oral presentation. The course teachers also meet with the students and convey information on the roles of biology and biologists in today’s society through a Facebook group. Feedback from the students, hosts and course teachers point to a range of benefits from work practice in discipline-oriented study programs. Based on our experience, we provide guidance for implementing such courses. Velle, G., Hole, T. N., Førland, O., Simonelli, A.-L., and Vandvik, V. (2017). Developing work placements in a discipline-oriented education Nordic Journal of STEM Education, Vol. 1, No. 1 (2017), pp 287-306. 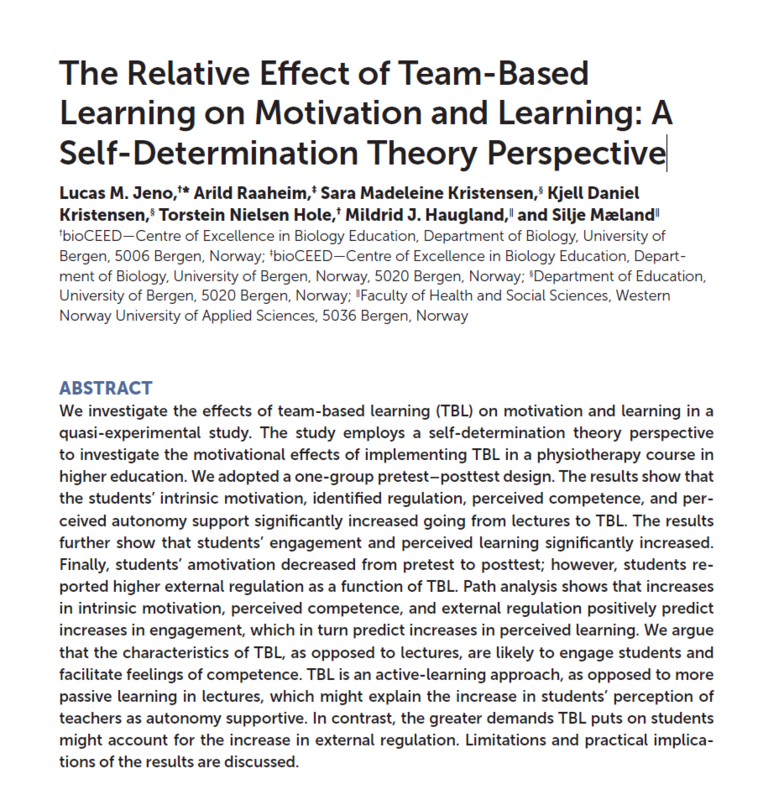 Lucas Jeno and colleagues from bioCEED, PRIME and Høgskulen på Vestlandet have recently published the article “The Relative Effect of Team-Based Learning on Motivation and Learning: A Self-Determination Theory Perspective”. We investigate the effects of team-based learning (TBL) on motivation and learning in a quasi-experimental study. The study employs a self-determination theory perspective to investigate the motivational effects of implementing TBL in a physiotherapy course in higher education. We adopted a one-group pretest–posttest design. The results show that the students’ intrinsic motivation, identified regulation, perceived competence, and perceived autonomy support significantly increased going from lectures to TBL. The results further show that students’ engagement and perceived learning significantly increased. Finally, students’ amotivation decreased from pretest to posttest; however, students reported higher external regulation as a function of TBL. Path analysis shows that increases in intrinsic motivation, perceived competence, and external regulation positively predict increases in engagement, which in turn predict increases in perceived learning. We argue that the characteristics of TBL, as opposed to lectures, are likely to engage students and facilitate feelings of competence. TBL is an active-learning approach, as opposed to more passive learning in lectures, which might explain the increase in students’ perception of teachers as autonomy supportive. In contrast, the greater demands TBL puts on students might account for the increase in external regulation. Limitations and practical implications of the results are discussed. Jeno, L. M., Raaheim, A., Kristensen, S. M., Kristensen, K. D., Hole, T. N., Haugland, M. J., and Mæland, S. (2017). The Relative Effect of Team-Based Learning on Motivation and Learning: A Self-Determination Theory Perspective. CBE—Life Sciences Education • 16:ar59, Winter 2017. Daniel Kristensen has conducted a qualitative study and interviewed Biology students about their experiences in everyday life at the University, and how their experiences affect their psychological well-being and motivation. He presented his thesis entitled “En kvalitativ undersøkelse om trivsel og motivasjon i høyere utdanning: Et selvbestemmelsesteoretisk perspektiv” on June 27th, 2017 and thus obtained his Master’s degree. In a self-determination theory perspective (Deci & Ryan, 1985), the quality of the interaction between students and the context can be a crucial factor for the student’s well-being and motivation. Central to the theory are the three basic psychological needs for autonomy, competence and relatedness. Self-determination theory argues that the satisfaction or thwarting of these needs may have a significant impact on well-being and autonomous motivation. To investigate factors in the learning environment that may interact with the satisfaction of the basic psychological needs in students may therefore be important. In this study, I aim to examine how students perceive their everyday life at the university, by shedding light on the students own account of their well-being and motivation. To solve the research question, I conducted a series of qualitative semi-structured interviews. This interview method is often used in qualitative research because it provides the participants and researcher the opportunity to have a relatively open discussion, with an already established theme. The interview participants were all students who (1) were freshmen at the university, and (2) were participating in a bachelor program in biology. The interviews were recorded on an audio device, and later transcribed. The transcribed data was deductively analysed, and later broken down to smaller segments and put into categories. The categories were subsequently linked to central assumptions in the theoretical framework. The categorization of the comments provided a base for further discussion and reflection. In the discussion, basic psychological needs theory was used in interpreting the participants comments according to the degree they felt their need for autonomy, competence, and relatedness was being satisfied or thwarted. In many ways, the discussion reflects my own interpretation and understanding of the link between the theory and the data material. By interpreting the data material in light of self-determination theory, it was possible to observe different processes and factors that may be paramount in student well-being and motivation. According to my own interpretation, all the participants in the study expressed that they enjoyed, and felt connected, to their academic environment. Some of the participants also conveyed that they felt competent and felt a steady progress in their studies. Furthermore, the participants indicated that the learning context felt autonomy-supportive. Satisfaction of the need for autonomy is, according to self-determination theory, crucial for intrinsic motivation. 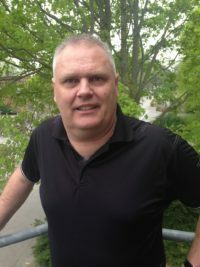 Oddfrid Førland, Vigdis Vandvik and Roy Andersson have published the article “The story of bioCEED or how to grow a SoTL culture from scratch“. There has been a gradual change over time towards an increased focus on the collegial and cultural aspects of teaching and learning. According to this perspective, quality emerges not within the individual, but within communities of teachers and students. Developing a quality culture requires a cultural shift supported by training and development activities to ensure that the teachers, as a collegium, have the knowledge and will to develop and change towards learner-centered teaching. Building a scholarly and collegial teaching culture, using the research culture as a model, was a first priority of Centre of Excellence in Biology Education (bioCEED). This paper discusses how a shift towards such a collegial Scholarly Teaching and Learning (SoTL) culture can come about, using the story of bioCEED as a case. I am the Centre Director of bioCEED, and am responsible for overseeing the activities and development of the center in relation to our plans, deliverables, and long-term goals. 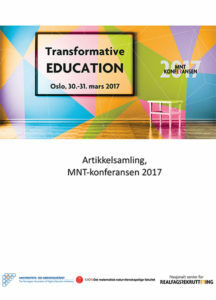 This year’s MNT-konferansen “Transformative education” took place in Oslo, Hotel Soria Moria on March 30th-31st. bioCEED contributed with 10 articles and corresponding presentations as well as an overview of the goals and activities of the Centre of Excellence. The full list of contributions and authors is found below with links to the articles published in the special edition of the Nordic Journal of STEM Education. Korleis få professorar med på ein kollegial SoTL-kultur? – R. Andersson, P. B. Eidesen, Ø. Fiksen, O. Førland, S. Stefansson og V. Vandvik. 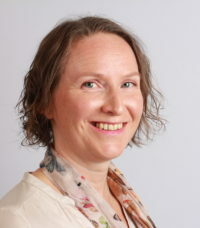 Collegial evaluation of writing as a learning activity in a bachelor programme – Heidi Lie Andersen, Øyvind Fiksen, Lawrence Kirkendall, Sigurd Stefansson. Strategies to document active learning practices in biology – Sehoya Cotner, Lucas M Jeno, Cissy Ballen. Utnytter vi potensialet for læring og personlig utvikling i feltundervisning? – P. B. Eidesen, A. Vader og J. E. Søreide. Hvordan teknologi bidrar til biologi-studenters motivasjon og læring – L. M. Jeno, J.A. Grytnes og Vigdis Vandvik. 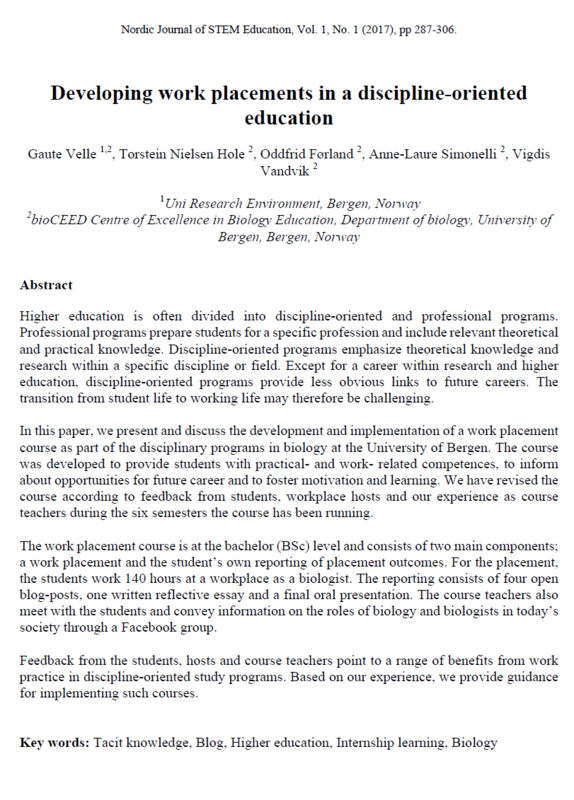 Developing work placements in a discipline education – G. Velle and T. Nielsen Hole. Numerical competence and quantitative skills in biology education – S. Eliassen, J. Kolding, J. Smedmark, and V. Vandvik. Sense and sensibility in workload calculation – Jonathan Soulé, Oddfrid Førland, and Tina Dahl. Norway’s gender gap: classroom participation in undergraduate introductory science – Cissy Ballen, Marie Danielsen, Christian Jørgensen, John-Arvid Grytnes, and Sehoya Cotner. Kan integrering i fagmiljøet øke motivasjon hos studenter? R. Gya og M. V. Bjordal. All articles submitted to the conference are available HERE. 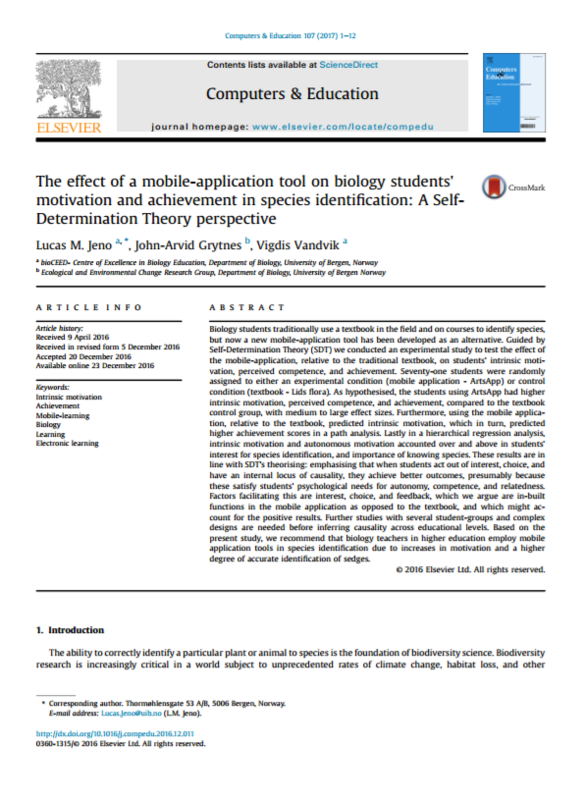 Lucas Jeno, John-Arvid Grytnes and Vigdis Vandvik have recently published the article “The effect of a mobile-application tool on biology students’ motivation and achievement in species identification: A Self-Determination Theory perspective”. A new research published by researchers at bioCEED has found that using an app (ArtsApp) to identify sedges helps students correctly identify more species, than using the traditional textbook method. Results of the experiment with 70 students from BIO revealed that the students found identifying species more interesting and enjoyable when using a smartphone or tablet. The students felt that they also were more competent after using the app than when using the book. These results are important because when students are undergraduate, identifying species could be difficult and uninteresting. By using modern technology, the teachers could enhance the students´ interest and learning in ways that perhaps is not possible when using a textbook. The study was published online in Computers & Education in December 2016 (see link below). Biology students traditionally use a textbook in the field and on courses to identify species, but now a new mobile-application tool has been developed as an alternative. 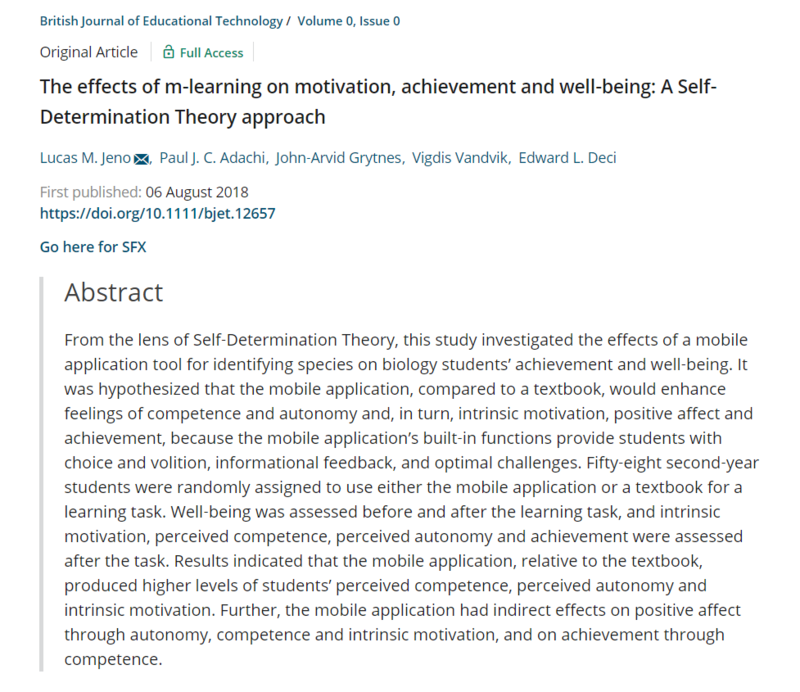 Guided by Self-Determination Theory (SDT) we conducted an experimental study to test the effect of the mobile-application, relative to the traditional textbook, on students’ intrinsic motivation, perceived competence, and achievement. Seventy-one students were randomly assigned to either an experimental condition (mobile application – ArtsApp) or control condition (textbook – Lids flora). As hypothesised, the students using ArtsApp had higher intrinsic motivation, perceived competence, and achievement, compared to the textbook control group, with medium to large effect sizes. Furthermore, using the mobile application, relative to the textbook, predicted intrinsic motivation, which in turn, predicted higher achievement scores in a path analysis. Lastly in a hierarchical regression analysis, intrinsic motivation and autonomous motivation accounted over and above in students’ interest for species identification, and importance of knowing species. These results are in line with SDT’s theorising: emphasising that when students act out of interest, choice, and have an internal locus of causality, they achieve better outcomes, presumably because these satisfy students’ psychological needs for autonomy, competence, and relatedness. Factors facilitating this are interest, choice, and feedback, which we argue are in-built functions in the mobile application as opposed to the textbook, and which might account for the positive results. Further studies with several student-groups and complex designs are needed before inferring causality across educational levels. Based on the present study, we recommend that biology teachers in higher education employ mobile application tools in species identification due to increases in motivation and a higher degree of accurate identification of sedges. 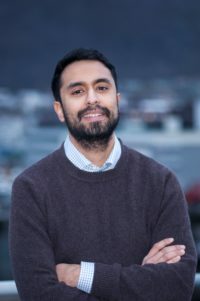 Lucas Jeno, PhD student at bioCEED, has recently published the article “Encouraging Active Learning in Higher Education: A Self-Determination Theory Perspective”. Based on the work of Self-Determination Theory, this article suggests how to implement Self-Determination Theory based principle in a learner-centered perspective. Higher education has traditionally rested on learning methods that render passive students. Societal changes require self-regulatory skills and an active motivational set. However, lack of theoretical, empirical and practical driven theory in implementation of learner-centered education has lead to a philosophical debate. It is argued for a holistic model for implementing principles derived from Self-Determination Theory (SDT) in a learner-centered paradigm. SDT makes specific prediction for nurturing vs. neglecting learning environments, and thus highly appropriate framework. An important differentiation between types of motivations that differs in relative autonomy, and social climates that may be perceived as amotivating, controlling, and informational is necessary for understanding learning and educational practices. Finally, practical recommendations for teachers in higher education to put into practice. It is argued for a system in which all levels of education supports motivation to support student motivation. Both the institutional level and teacher culture must have a learner centered perspective, further, pre-during-post class preparations are important for high quality learning. 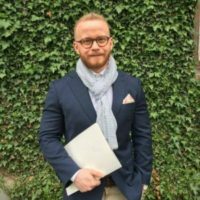 Torstein N. Hole, PhD student at bioCEED/PRIME, has recently published the article “Developing Collaboration as a Transferrable Skills in Biology Tertiary Education”. Transferable skills as a concept in tertiary education has received increased interest since the Bologna process and through developments in the work market. The concept as a learning goal is seen as a means for ensuring employability in a changing industrial economy as well as increasing legitimacy of skills that are desirable across different disciplines. 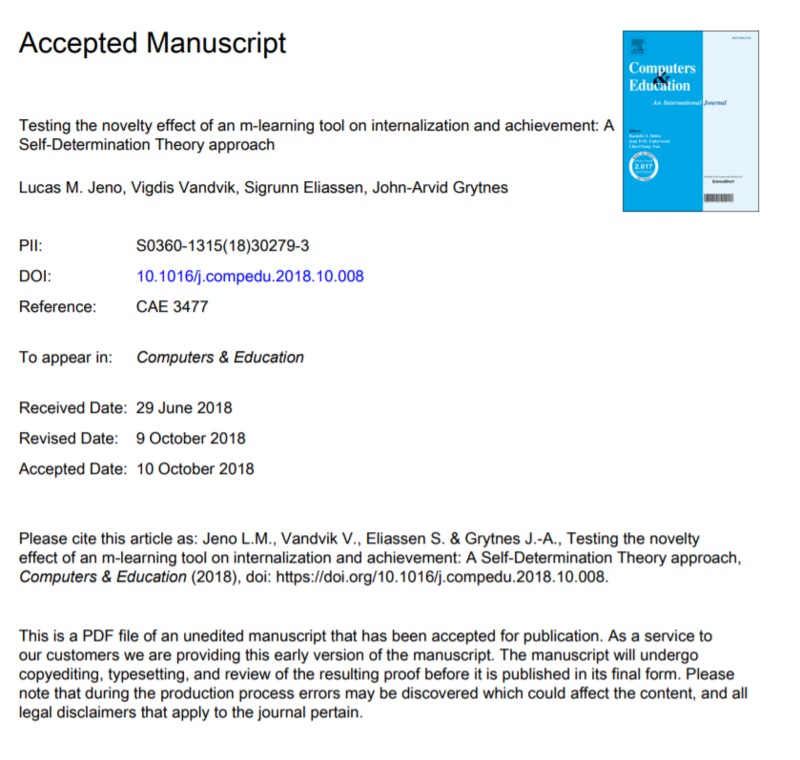 In this paper I will present some means to develop legitimacy in transferable skill learning in discipline education in general and biology education specifically. A concrete focus is collaboration, which functions as an example of how the intangible nature of some educational goals requires a theoretical response. This is performed on the basis of theoretical conceptions about tacit and work-place learning. Hole, T. N. (2015). Developing Collaboration as a Transferrable Skills in Biology Tertiary Education. Literacy Information and Computer Education Journal, 6(3), 1971-1975.